Takasago Sushi is a sushi bar in Higashi-Yukigaya, Ota-ku, Tokyo. Our shop is the appearance that it is easy to get close to in the corner of the mall. But the ability gets a high evaluation so as to win the championship at a "TV Champion". 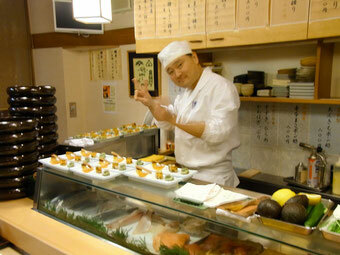 The chef goes to Tsukiji every day and chooses the direct fishery products based on experience. And we provide sushi which we cooked using a Japanese traditional technique and new sensitivity. I aim at our choosing here, and coming true, and making a relaxing place. We offer delicious sushi, Japanese food, liquor. And we continue making an effort every day to have visitors spend a happy time. We promise to offer the best hospitality to you.